Cabinet is fully behind the decision to push ahead with plans to introduce casino gaming to Bermuda, according to minister Shawn Crockwell. Dismissing rumours there are rifts within Government over the decision to forego a referendum the tourism minister yesterday unveiled how casino gambling could be rolled out on the island. Asked if the party’s handling of the issue had caused divisions in the party Mr Crockwell said: “The Cabinet has been extremely unified on this issue and so has the Parliamentary caucus. “I would say 98 per cent of the caucus are very supportive of the decision we have made to move forward. “As far as how the decision has affected the party, I do not think it has had a negative impact. A party insider told the Sun that the way the gaming issue had been dealt with had been a cause for concern within the OBA. The source said: “It has caused concerns amongst some party members. Yesterday at a press conference Mr Crockwell revealed that there would be no restrictions on locals gaming if the legalization of casino gaming was passed by Parliament. And he said Government would adopt an Integrated Casino Resort model where casinos would be part of existing hotels rather than isolated entities. Mr Crockwell added: “Although we will be unique and maintain our special Bermuda brand this model is similar to the Aruban and Singaporean casino models. “It is paramount that the government now engages the public with the salient information concerning what we are proposing and all of the main issues surrounding this industry. The Tourism and Transport Minister’s comments came just hours after an online petition calling for a referendum on casino gambling was launched by a group led by Kim Swan, Jonathan Starling, Stuart Hayward and Michael Ashton (see page 6). Mr Crockwell dismissed the suggestion the group was ‘wasting their time’ and said he looked forward to receiving the petition. He added: “Democracy is not a waste of time. I would urge the group to get involved in the public education programme. Meanwhile some political commentators believe the formation of the pro-referendum group could spell trouble for the Government. He added: “I feel there was a lot of dissatisfaction at the way Government handled the decision not to go ahead with the referendum and the PLP came out of it looking like they were the good guys. “I think, unintentionally or not, this petition has a chance of putting the Government in a corner, of causing it a lot of embarrassment and a lot of bad headlines. 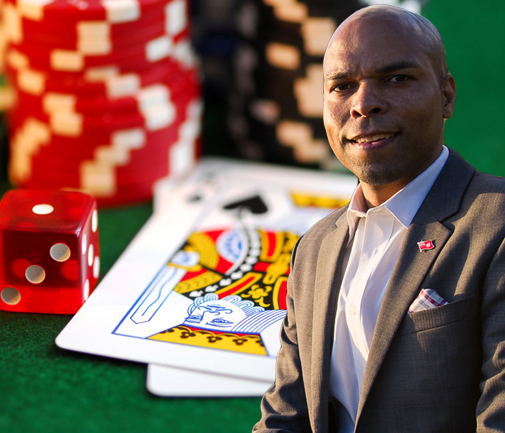 The Government of Bermuda has decided to proceed with the establishment of legalized casino gaming through the parliamentary process. This was a difficult decision for the government but in the circumstances we are confident it was the right decision for Bermuda. We are also confident that the majority of Bermudians support the introduction of casino style gaming. This is supported by recent polling results which suggest that approximately 70 percent of Bermudians favor the legalization of gaming in Bermuda to assist in bringing jobs, increase tourism and generate revenue on the Island. These poll results will be made available during our upcoming public education program that I will highlight momentarily. For the past several months the government has worked diligently in gathering research to get the facts about gaming and to ascertain the best model for Bermuda. We engaged industry leaders as well as consulted with past and current leaders of jurisdictions that have already implemented casino gaming and believe we are on the right track in creating an industry that will be beneficial to the island whilst limiting adverse effects. One of the benefits of getting into this industry late is that we can learn from the mistakes of other jurisdictions. Following an extensive review and analysis, the government has decided to embrace the Integrated Casino Resort model for Bermuda. Although we will be unique and maintain our special Bermuda brand this model is similar to the Aruban and Singaporean casino models. It is paramount that the government now engages the public with the salient information concerning what we are proposing and all of the main issues surrounding this industry. There is a great deal of misinformation out there about the casino gaming industry and what we as the government plan to implement here in Bermuda. We want to disseminate the facts and hear everyone’s view on this issue. During the public education period, we will share the data we have collected which will include the potential economic benefits, potential social risks and how to mitigate against those risks and the potential for job creation for Bermudians. We appreciate the importance of including the public in the process and the education program will give anyone that is interested an opportunity to be heard on this vital initiative for Bermuda. It is important that the government is able to communicate as well as educate Bermudians on the Vision, Goals, Objectives and Measurable outcomes associated with casino gaming. Furthermore, it is important for Bermudians to understand that they do have a voice in this process. I am here today to announce that the Ministry of Tourism Development and Transport will roll out an aggressive calendar of events with the intention of providing awareness and education on Casino Gaming in Bermuda. We will commence our public education program on January 27th and will host 6 town hall meetings starting on February 6th. Three of the six meetings will provide a general overview of Casino Gaming and an overview of the Integrated Casino Resort model and why we feel this model best suits Bermuda. Two of the meetings will be topic specific and will outline the plan the Government will take to mitigate against social risks as well as the job creation opportunities Casino Gaming will bring to Bermuda. Working with non-profit organizations, particularly those that deal with social ills as well as our faith community, will be imperative to our success with this industry. Finally, we will host an open mic event for young professionals that will address the questions and concerns of this demographic in relation to the casino gaming industry. Unemployment amongst this demographic is reported to be as high as 25 percent. The government is also working to support a jobs fair that will highlight the various employment opportunities in this industry and provide information on how Bermudians can get a jump start on training for future job opportunities. We will be working with numerous entities to ensure the information provided is timely and accurate. Bermudians will be able to obtain information via the web, social media as well as traditional media outlets. We will have an open comment period that will begin on January 28th that will give Bermudians access to a dedicated website 24 hours per day. This will allow Bermudians the opportunity to give feedback, ideas, and concerns related to gaming in Bermuda. The official comment period will end on February 28th. I personally invite the public to get fully engaged in this education program and have your voice heard. We must get this right for our island and I want the public to know that we, your Government, took the time to ensure that this decision was in fact the right decision for Bermuda’s economic future. Casino Gaming is not a panacea but a much needed amenity for our tourism product. We must augment our tourism offerings and we must enhance our tourism infrastructure. The data shows that with the implementation of responsible and well regulated casino gaming we can attract new high-end hotel brands and additional hotel inventory. Casino gaming will bring hotel investors to the island which will lead to Bermudian jobs. I close by saying that we have a wonderful opportunity to set the example by working together to implement the best holistic casino gaming model this world has seen. Let us usher in a tourism renaissance together.